The rally has picked up pace again today, after a rest day in Lahore. This followed another neutralised day on Friday with cancelled time controls following more long border delays, this time between India and Pakistan. The route has been hot and dusty but reasonably straightforward. Accordingly, most positions are unchanged at the end of the 23rd day of the event - more than halfway through... The Catt Cortina still leads ahead of the 1958 Citroen 2CV of Johan Van der Laan, which keeps its nose in front of the Broderick Ford Anglia. 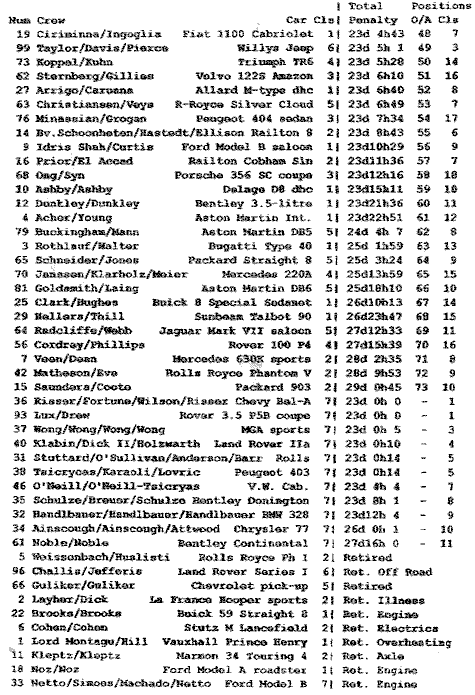 Eighty four cars are still running, including 11 in the touring category which is led jointly by the Risser Chevrolet (No 36) and the Lux Rover (No 93), the latter's penalties having been adjusted after moving to the touring class from the main group. The Noble Bentley Continental (No 61) still languishes in last place in the touring class, reportedly because the crew elect seldom to pause at controls - preferring to press on at all times! The sub 4.1-litre pre-1950 class, which has seen the bulk of retirements so far, is still led by USA crewed Jung Ford Coupe (No 24), a 1950 machine. 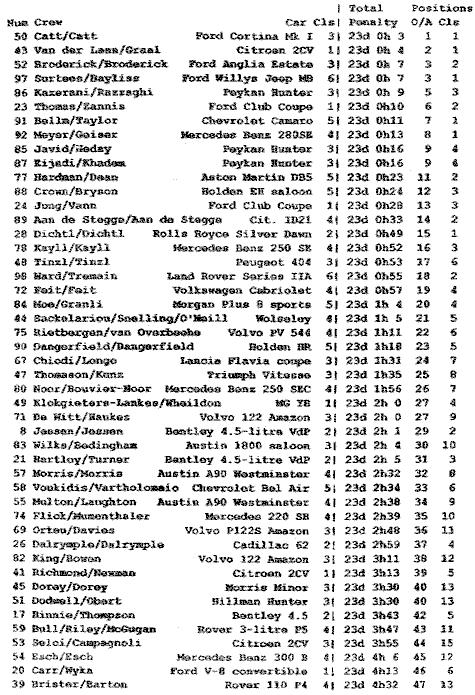 The Dichtl Rolls-Royce (No 28) leads the larger engined early cars, in an impressive 15th overall. The top-placed pre-war car is the 1929 Bentley (above left) of Danish crew of Kjeld and Hans-Henrik Jessen (No 8) which impresses in 29th place, some two hours ahead of the similar USA-crewed machine of William Binnie. Tomorrow sees not only one of the rally's longest days but also one of the hardest, with a long, steep hillclimb organised by the Pakistan Motor Federation. Doubtless this will favour the faster, more powerful cars and this may bring disappointment for the Van Der Laan 2CV which will struggle to hold on to second overall, with just 700cc to drive it up the climb. Similarly the four-wheel drives are unlikely to fare well in a situation where their greater traction and ground clearance are not an advantage.